At the start of 2005, I challenged myself to do something with all these original printing Jyhad cards. You could practically get them just for the asking and it seemed a good opportunity for someone to do the classic business maneuver of adding some value to them by repacking them in a more desirable form. Of course, in the world of CCGs, one of the hardest things to come by is a good deck design. So I decided to design decks comprised almost entirely of original Jyhad card stock and make them as competitive as I could. I nicknamed this project the Barbed Wire Project, because it reminded me of the original sales pitch for Barbed Wire in the Old West, “Cheap as dirt and strong as whiskey.” That was my goal for these decks. I decided to build seven different decks from the Jyhad cards, for each of the seven vampire clans that was introduced in the original set. I knew going in that certain clan decks would end up being much stronger than other clan decks because certain strategies are inherently favored compared to other strategies. Bleeding (which is the game term for directly reducing your opponents life total) at stealth (which makes it hard to stop) is a dominant strategy for victory and a tournament favorite while combat (directly attacking your opponent’s minions) is commonly regarded as a weak strategy. Each clan has certain specialities and the clans such as the Malkavian, which can easily bleed at stealth, are going to enjoy advantages over the Gangrel, who are really only good for fighting in the basic Jyhad set. The Tremere clan are in a kind of strange middle ground. In terms of the Jyhad set, they have the powers of dominate, which gives them tremendous bleed potential, but no stealth abilities. This situation is largely true of the clan in all sets of the game, but a single stealth card was recently introduced and in the 2008 North American Championship, and I began seeing Tremere “sneak and bleed” decks. The Tremere’s other disciplines, are Thaumaturgy, (which is mostly a combat discipline) and Auspex (which allows you to counter stealth on your opponent’s actions). The reason the Tremere are a difficult clan to play. They can bleed for a lot with dominate, but they don’t have the stealth to get it through. They can try to go with a traditional “Bruise and Bleed” strategy of a combat threat combined with a strong bleed threat, but that runs into two problems: that strategy is not the strongest, and the Tremere only have Thaumaturgy for their combat. Their other two disciplines, Auspex and Dominate, have very little in the way of combat support. This makes it challenging to have a strong combat threat. One of the things I’ve found is that the same issues I come up with in constructing that Barbed Wire Decks are the same issues that confront a clan in the larger sense. Sometimes a certain vampire (minion) will be introduced to compensate a clan for its overall perceived weakness, but often what will happen is we will see decks surfaced that are based on that particularly strong minion on not the rest of the clan. For instance, the Gangrel are perceived as a rather weak clan because combat seems to be the best thing they can do with their discipline set. However, Stanislava (who was introduced in the Dark Sovereigns expansion) has superior dominate and +2 bleed. This allows for people to put sneak and bleed decks together utilizing Stanislava’s protean ability for stealth. The Stanislava is certainly a viable deck (I’ve won with it myself) but it doesn’t correct for the overall problem that the Gangrel have a problem. In my next post, we’ll examine how the I tackled the problems specific to the Tremere in designing my latest version of the Barbed Wire: Tremere Deck. 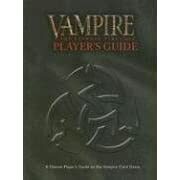 Meanwhile, if this topic interests you, I suggest you take a look at the VTES player’s guide. Ben Peal, an American VTES player who has racked up the most North American Championship wins, is one of the co-authors of the player’s guide to VTES. He is also one of my investing clients so I tend to post discussions and emails between the two of us on this blog. The VTES players guide reviews the dominant strategies for each clan as well as the game in general, and is recommended reading if you are a serious VTES players.